Usually when we hear of a photographer in jail we fear the worst. A foreign correspondent imprisoned; a street photographer detained in violation of civil liberties; a protest photographer swept up in riot police mass arrests. Belgian photographer Sebastien Van Malleghem went to prison of his own free will. In fact, he was invited. Early this year, the authorities were preparing to open Beveren Prison, a new facility in the north of the country designed for 312 prisoners. Prior to the opening, the authority invited members of the press and criminal justice professionals to experience life inside. 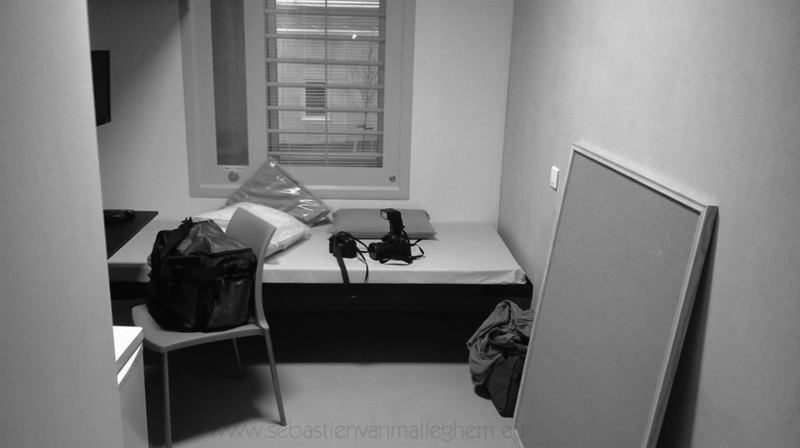 Joining Sebastien Van Malleghem in the temporary prison population were reporters, a TV crew, lawyers, a judge and even some prison guards. Collectively, they were guinea pigs to ensure the smooth running of the new state-of-the-art systems … which were not always smooth. Prison Photography (PP): You were on assignment? Sebastien Van Malleghem (SVM): Yes, for De Standaard, a Flemish newspaper. I made 45 photographs and they published 10. PP: You’ve photographed in prisons before. SVM: Yes, in the prisons of Marneffe, Ghent, Nivelles, Namur, Ittre, Forest, Berkendaele, the now-demolished Verviers, and Paifve a prison for mentally-ill prisoners. PP: How did Beveren compare? SVM: There are many fences. Many doors. You can’t have clear vision, you can’t see any landscape. Vision is limited to, maybe, 15 meters. It is not going to be especially better for the minds of the prisoners. So I’m ambivalent about it. PP: In the past, you have shot in black and white (as opposed to your colleague Laure Geerts who photographed in colour) Why black and white here, too? SVM: I took the option to do something really cold, clear and disturbing. To get at people’s emotion. In the beginning [my fellow prisoners] were smiling and I watched them to see how they would be after five hours being in a cell of 8-meters square. Obviously they were looking a bit stressed and tired. My point of view was a tiny bit different from the others guest-prisoners because I had press authorization, so the door of my cell was a open a bit more to let me shoot some pictures. PP: What was your goal? SVM: I was thinking about the prison riot. And why. The punishment of prison is to deny freedom. The punishment is not to give no freedom to your mind or to let you live inside these cold buildings without anything. Why not let prisoners have something more comfortable? They’re already outside of society. You’re already inside of a prison with a full range of walls and a huge perimeter boundary with razor wired and electric fences. So, why not put inside something more human? That’s exactly what I’m fighting for. SVM: There is no emotion. You go into a closed square, and then another one, and then another one. Squares and squares and squares. I’m not sure that prisoners will see more psychologists or people like that to help them [at Beveren]. PP: It’s a tightly controlled, sterile, modern prison. Small, clean boxes. SVM: Why must we — in the 21st century — have jails like those in the middle ages. So small. When you need to eat and get your plate you just don’t have space to move your arm, space to turn around. You cannot open the window. There is a security system. You turn a button to get fresh air from outside but you can’t open the window. Suddenly, you just feel like you don’t even have space to fall forward. While I was sleeping, the guards would come by every two hours. There is no agenda; they just come and check, open the little hatch in the door. You have no privacy. PP: How many people from the media went inside the prison? SVM: I was with a writer, there was another photographer/writer team, two teams from a TV channel. Maybe, ten media persons. It was training for the guards, to see what was wrong inside the prison. A journalist wrote that there were real problems. PP: What is Prison Cloud? SVM: There is a flat screen in each cell. In this new prison they wanted to try new “modern” things. Prison Cloud is a basically a kind of internet designed for prisoners. Keyboard, flatscreen, and the mouse. Prisoners can order a tiny bit more food or cigarettes and pay. Stuff is a bit more expensive but it’s easier for the prisoners to order through the computer. Also they have very restricted access to internet — only a few pages that they can go to such as the employment office, government websites. They can also order and pay for movies to watch. When men enter inside the prison, they are fingerprinted and given a USB key where all their personal information is recorded. They need to put the USB key in the computer to gain access. The prison checks everything they’re doing on there. PP: It sounds oppressive, but we’d expect that, no? SVM: I deeply believe that a cell of 8-meters square makes you nervous and/or lazy. When you’re locked up, your thoughts turn quickly: “What’s my option in here?” You can struggle to stay in shape doing some exercise, reading books and keep your mind busy with some crazy plans that only your brain can imagine or just lose it all and spend your time laying on your bed. From your cell, you can hear what’s happening in the wing, but you can’t see it and so you start to play stories in your head. The sounds of the voices and the steps of the guards are like an echo in your head. Always a background noise that could be compared to the type of headache that you catch when you’re tired. PP: Your overall thoughts from the experience? SVM: In this prison, it is as if the point of punishment is not only to separate a prisoner from freedom, but to box the prisoner in the smallest and the most claustrophobic space possible.